Habit: Annual. 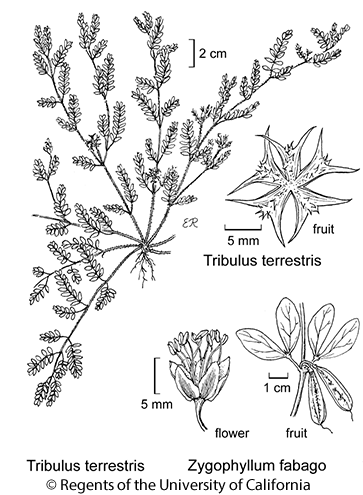 Stem: prostrate, spreading radially, generally < 1 m. Leaf: even-1-pinnate; stipules +- leaf-like. Inflorescence: flowers 1 in axils. Flower: sepals deciduous; petals yellow, deciduous. Fruit: 5-lobed, splitting into 5 nutlets, each with many tubercles, 2--4 stout spines; style deciduous; pedicel reflexed. Seed: 3--5 per chamber. Stem: +- silky or appressed-hairy, also sharply bristly. Leaf: stipules 1--5 mm; leaflets 6--12. Flower: < 5 mm wide; pedicel generally < subtending leaf. Fruit: 5 mm, < 1 cm wide, +- flat, hairy, gray or +- yellow; spines 4--7 mm, spreading, hairy to glabrous. Ecology: Dry, disturbed areas including roadsides, railways, vacant lots; Elevation: generally < 1000 m. Bioregional Distribution: CA; Distribution Outside California: to Wyoming, eastern United States, central Mexico; native to Mediterranean. Toxicity: TOXIC to livestock in vegetative condition, fruits cause mechanical injury. Flowering Time: Apr--Oct Note: First collected in California in 1902; long a pernicious weed, now controlled by introduced weevils. Citation for this treatment: Duncan M. Porter 2012, Tribulus terrestris, in Jepson Flora Project (eds.) Jepson eFlora, http://ucjeps.berkeley.edu/eflora/eflora_display.php?tid=46922, accessed on April 19, 2019.